South-by-Southwest Music, Film and Interactive Festival March 7-16, may have ended, but live music continues at venues all over town. In South Austin, a few older gray-haired musicians can still draw big crowds any night of the week – even if the majority of folks dancing qualify as senior citizens as old as 91. The familiar saying “the older the fiddle, the sweeter the tune” applies to the Sunset Valley Boys, musicians mostly all 65 years old or older. Their original steel player Craig Park, has been recovering from a stroke he suffered 18 months ago. Current steel player, Mark Erlewine, 63, owns Erlewine Guitars, a custom design shop that often repairs Willie Nelson’s “trigger” at 4402 Burnet Road. Erlewine joined the band last New Year’s Eve. Other original members of the band include: attorney Polk Shelton, 71, who plays rhythm guitar and sings lead vocals, 65-year-old semi-retired business man Ken Simpson, on rhythm guitar and vocals, and Gordon Fowler, 71, on lead guitar. The Sunset Valley Boys include Charlie Irwin, 66, who plays bass, who also performs with four or five other local bands including: Bill Kirchen and Commander Cody. Sherman Lindsay, 66, who plays drums, works for Texas Parks and Wildlife Department by day. “The punk kid’ in the band,” 35-year-old fiddler player Mark Seale, works a day job as a tech with Xerox. The band has three regular gigs. 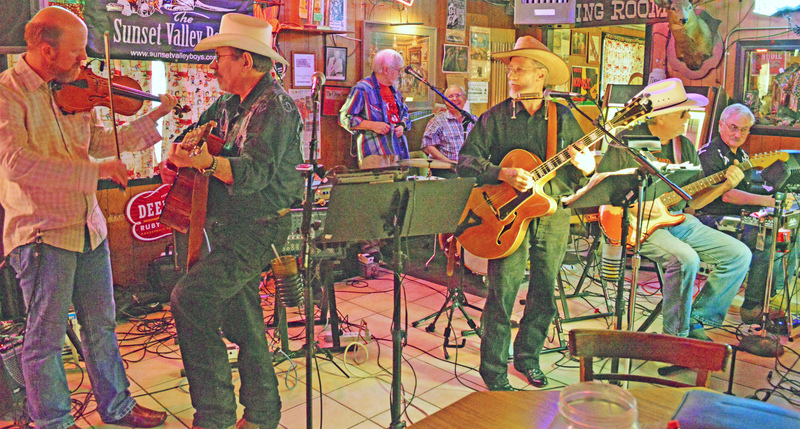 They perform the third Wednesday of the month in the dining room of the Broken Spoke, 3201 S. Lamar, from 6 to 8 p.m. They also play down the street at Baker St. Pub and Grill, formerly the Alligator Grill, at 3003 S. Lamar, the first Saturday of every month from 3 to 5 p.m. They play at the South Austin Senior Activity Center, 3911 Manchaca Road, the third Friday of every month from 7:30 to 10 p.m. They also play frequent gigs at: Veterans of Foreign Wars (VFW) Post 8925 off 8707 FM Road 812, VFW Post 8456 in Geronimo, Texas about 10 miles east of San Marcos at 6808 State HWY 123, and Sons of Hermann Hall at 9611 Decker Lake Road. They have also played a few special occasions at the Elks Lodge at 700 Dawson Road, off Barton Springs Road in Austin. “So we make enough money to keep the wolves away from the door. We’re very very fortunate to be able to do what we like to do. It’s not about money, it’s about freedom and not having to answer to anybody and doing what you love to do,” Fowler said. Fowler and Shelton as kids played in one of Austin’s earliest rock and roll bands in the late 1950s through the early 1960s, the Nite Lites, as teenagers. They played rhythm and blues and rock and roll — mostly cover songs during a time when only country bands performed at honky tonks in town. He and band members played for $20 each to play gigs during the “Teen Canteen” day summer camps once offered around town by the City of Austin. “That was fun, we played all over town doing that. Twenty dollars back in the day — in the 1960s was a lot of money. You fill your car up with gas for $2, cigarettes were .25 cents a pack, and beer was about $1.10 for a six-pack. So we sometimes had $20 or $30 in our pockets. We thought we were rich,” Fowler said. “Polk was left handed and couldn’t find a left-handed guitar because they were more expensive and harder to find. So we bought him a right-handed one and taught him to play,” Fowler said. After high school at 22 years old, the U.S. Army drafted him, but Fowler joined the Marines instead. He served two years and a 13-month tour of Vietnam. Over there, he continued to play guitar as a hobby during his free time when he wasn’t chasing stories on the battlefields. He suffered injuries twice in the line of duty. As a Marine stationed in Vietnam, Fowler wrote feature stories for the publication, Stars and Stripes and sent press releases to soldiers’ hometown newspapers. “We wrote our stories on a typewriter when we could find them, but sometimes we wrote them on the back of a cardboard box that once held C-rations, using a pencil to write with. We’d write our story on the cardboard and send them back to headquarters by helicopter once it landed. We would hand the cardboard to the ‘crew chief’ — the guy who sat at the helicopter door with a machine gun. We would ask the crew chief to file the story for us in Da Nang. It was rare, but we did it,” Fowler said. Fowler’s love for playing music had never left him, not since he first plucked strings on an old $10 beat up guitar in the second grade. When he turned 12, his father bought him a nicer instrument, an electric Gibson. A few years after that, he bought himself a Fender guitar. “Back then I liked rock and roll, but it was just getting started in Texas. Chuck Berry came out with ‘Johnny Be Good’ in 1955 when I was in the sixth grade, so we got interested in that early rock and roll. Basically, nobody wanted to be in an old hillbilly band and that’s basically all Austin had back then,” Fowler said. The members play mostly Merle Haggard and George Jones tunes and other country songs made popular before the 1960s. They will perform music by Chuck Berry too, upon request. The Sunset Valley Boys performed their first gig together as a band at Evangeline’s Café in April of 2006. A band member who at the time lived in Sunset Valley, came up with the moniker, though the group has gained a following and a name for itself in South Austin by performing solid gold standard hits. “The first time we played in Evangeline’ we probably had 75 people squeezed in that little building and from that day forward the crowd just got bigger and bigger,” Simpson said. “We had no room for dancing, so we just outgrew the Evangeline Café. Seniors who come to see the Sunset Valley Boys come to dance; they come early and they stay late, he said. The latest the band has played was 12:30 a.m. last New Year’s Eve at the Son’s of Hermann Hall’s bash. Every one of the band members have separate careers by day, or work jobs before 5 p.m. and nobody talks about retiring any time soon. Shelton and Fowler, attended Eanes Elementary together since the second grade and have played together since attending O’Henry Middle School. Afterwards, Fowler moved to San Angelo for a short time and Shelton attended Austin High School before his folks sent him to Kemper Military School in Boonville, MO. 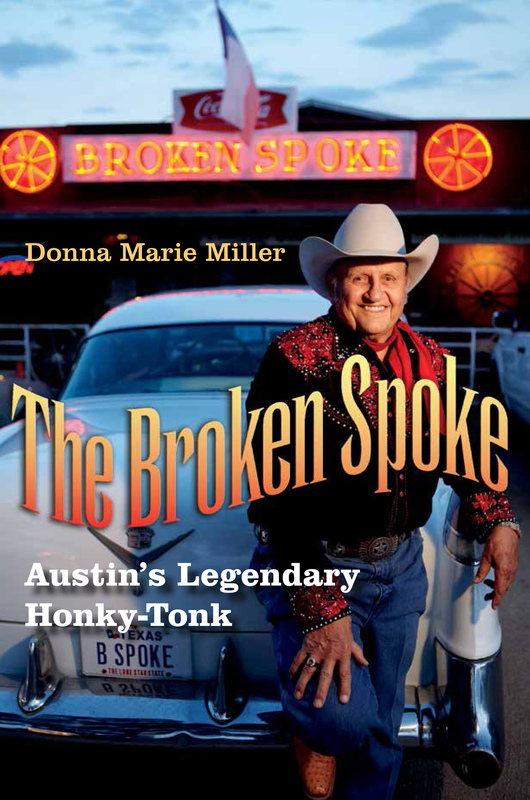 “We all did that – we all left and came back to Austin. I came back in 1961 and attended UT,” Shelton said. As a student at the University of Texas, Shelton played in his rock band on alternate weekends than Roky Erickson and his band, the 13th Floor Elevators at the Orlean’s Club. Shelton left Austin again in 1965 to attend St. Mary’s Law School in San Antonio. Meanwhile, he performed at the Pearl Pavilion at the Hemisphere Fair there. “When I came back to Austin in 1970, it seemed the whole world had changed,” Shelton said. He became a criminal defense lawyer by day and a country singer and performer by night in Austin. Playing music has helped remove the dark images that remain in his thoughts at night after working all day long with criminals. Shelton grew up listening to folk and blues musician Huddle William Ledbetter known as “Lead Belly,” a virtuoso who once played multiple instruments including a 12-string guitar. His parents named him after James Polk, the 11th president of the United States, who helped acquire more than 800,000 square miles of the western territories, but he tells everyone that they named him after James Polk Street in Austin. Shelton performed at Saxon Pub as a soloist and later had a trio band that played happy hours there from 1996 through 2000. Shelton said he doesn’t ever remember performing at Donn’s Depot, 1600 W. 5th Street, but he did play there too, more than 16 years ago back when he drank alcohol. The bar’s proprietor Donn Adelmann has been a friend for years. Shelton, is also a songwriter who in 1975 became a finalist at Kerrville’s Country and Western Jamboree with judges that included Johnny Cash and Waylon Jennings. He also sang on the soundtracks for two videos: “Exploring Entertainment” in 1998 and “Front Porch Music” in 2000. He seldom performs his originals today, but chooses instead to sing cover songs to please local audiences. He said that he enjoys playing and singing close to his audience. The band has a regular following, wherever they perform. He and his wife, Barbara Shelton, have been married 33 years. They have three daughters and one grand daughter. Simpson didn’t start playing music professionally before 15 years ago. He had a couple of businesses that he ran and sold before he semi-retired and started playing in a hobbyists’’ band at the former Acapulco Restaurant in the strip center at the “Y” off US 290 West in 2002. The band didn’t have a name until it became a steady hobby for a few musicians. First Fowler showed up, then Shelton. Soon, they started booking gigs wherever they could. Simpson became interested in playing country music while attending William B. Travis High School. He graduated in 1966 and then joined the U.S. Marine Corps. He later joined the Marine Reserve and discharged honorably in 1973 before starting his own business, Midway Welding and Iron, off East First Street. He sold the building and the company in 1988 and to become an associate with Joe Bush Ironworks. He semi-retired in 2001. He didn’t play guitar at all during his military years. When he started working in the steel business, he picked up his instrument again from time-to-time. Erlewine has owned his guitar shop 45 years and performed for 20 years musically from the 1960s through the 1980s, before taking a 16-year hiatus in the 1990s. “When I had a child I gave up the night life. I spent 16 years raising him and stayed out of the bars. He’s 20 now and in the US. Air Force. So my wife, Dianne, talked me into playing. She kept asking: ‘Why don’t you play steel anymore?’” Erlewine said. When Erlewine moved his guitar shop here from Ann Arbor, MI in 1974, he immediately found gigs playing at Armadillo World Headquarters with the Reynolds Sisters and also with The New Oso Band. He played with Kenneth Threadgill in his band in the late 1970s and continued through the ‘80s. Erlewine also played for nearly 20 years with Al Dressen and his Sunset Riders at the Broken Spoke and other places in town. Dressen had another band, the Super Swing Review that Erlewine played in too at dance halls all over Texas. Off stage and while away his custom guitar shop, Erlewine enjoyed a recording career as well. Erlewine likes the music and the “low pressure” gigs that Sunset Valley Boys play. “I like all the guys in the Sunset Valley Boys band and we always have a good time,” Erlewine said.